Use 16 ounces to every 200 gallons of fuel. 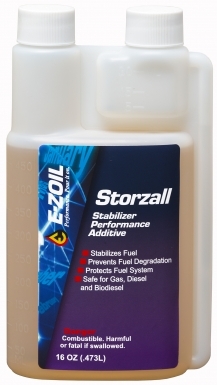 The best fuel storage performance additive, STORZALL uses an anti-oxidant formula to inhibit fuel oxidation, protecting your fuel system and engine components and helping prevent breakdowns. STORZALL preserves fuel for up to 12 months. For storing fuel over 30 days, reach for STORZALL!